The coconut, graham cracker-crusted, custard-filled, chocolate delicacy warmly known as the Nanaimo bar is earning a reputation as Canada’s sweetheart after Canada Post announced it would be featured in a new stamp collection. 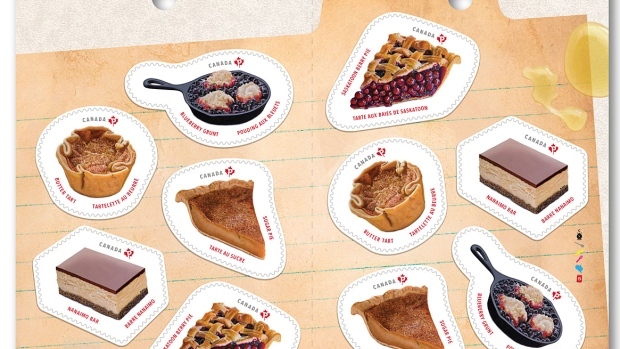 The “Sweet Canada” stamp collection, set to be released on April 17, features five treats including the Nanaimo bar, Saskatoon berry pie, butter tarts, tarte au sucre (sugar pie) and blueberry grunt. Each of the sweets included in the collection has deep Canadian roots. From butter tarts, which have become an object of competition and pride in communities around the country, to Saskatoon berry pie, described as a “true Canadian original” by Canada Post. However, the butter tart has also earned accolades in Canada’s dessert landscape. The Kawarthas Northumberland Butter Tart Tour in Ontario promotes over 50 bakeries to choose from. Of course, there is a Nanaimo Bar Butter Tart worth sampling along the route. But aside from a popularity contest, Canada Post has also ignited an age-old debate with its new stamps; should a butter tart include raisins?